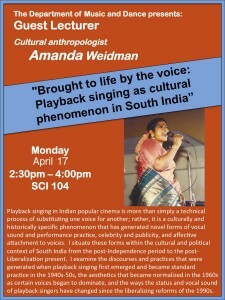 Guest Lecture: Amanda Weidman, Cultural Anthropologist. 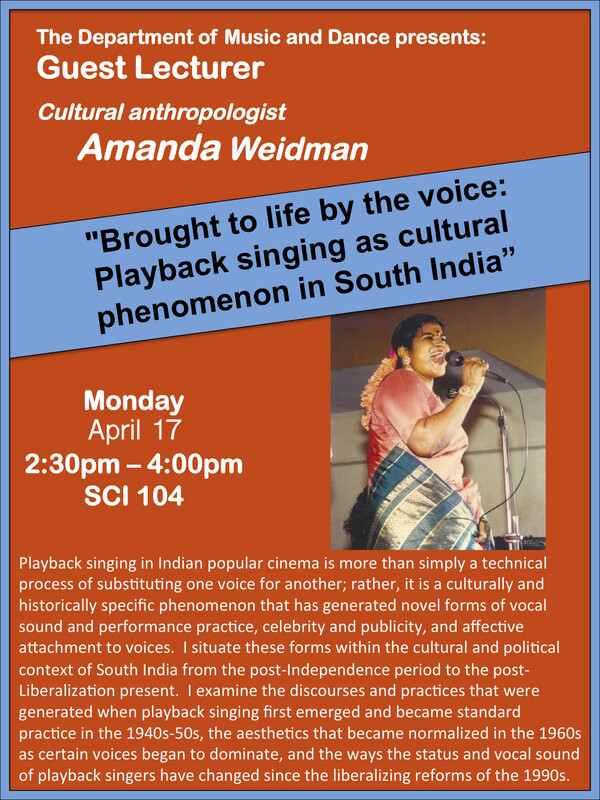 Amanda Weidman is a cultural anthropologist whose work in Tamil-speaking South India has centered on gender, technological mediation, music, sound, and performance. She is the author of a book on the social history of Karnatic (South Indian) classical music, Singing the Classical, Voicing the Modern: The Postcolonial Politics of Music in South India (Duke Univ. Press, 2006). Her current research project is on playback singing in the South Indian Tamil-language film industry. She is also a Karnatic violinist. Playback singing in Indian popular cinema is more than simply a technical process of substituting one voice for another; rather, it is a culturally and historically specific phenomenon that has generated novel forms of vocal sound and performance practice, celebrity and publicity, and affective attachment to voices. I situate these forms within the cultural and political context of South India from the post-Independence period to the post-Liberalization present. I examine the discourses and practices that were generated when playback singing first emerged and became standard practice in the 1940s-50s, the aesthetics that became normalized in the 1960s as certain voices began to dominate, and the ways the status and vocal sound of playback singers have changed since the liberalizing reforms of the 1990s. Free and open to the Swarthmore community. This entry was posted in Dance on April 12, 2017 by twebb1.